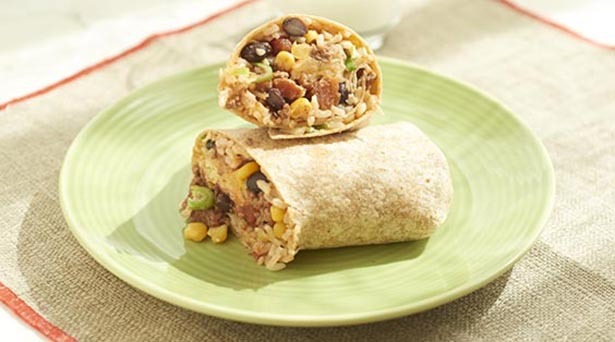 These cheesy beef burritos are easy to prepare and quick to heat up in a microwave oven. In a medium non-stick skillet, brown ground beef and garlic over medium heat (break beef mixture up into smaller chunks with a spoon). Drain fat and stir in 1/2 cup of the salsa; set aside. Spread 1/3 cup of rice on center of a tortilla, leaving a 1/2-inch border. Scatter about 2 tablespoons of beans and 1 1/2 tablespoons of corn over rice. Spread 1/3 cup of the beef mixture and 1/4 cup of the cheese over corn. Top with 2 teaspoons of salsa and a few pieces of green onion. Fold in two opposite edges of tortilla one inch each and roll up. Place burritos in a microwave oven and heat 1 minute of until heated through. Serve with remaining salsa.